In 1965, in hearings before the Senate Commerce Committee, General Motors, Ford and Chrysler admitted that they had known about a number of serious safety defects in their products in the past. They typically handled these problems by telling their dealers to repair the defects when the vehicles were brought in for service, but rarely if ever reported the defects directly to the car owners. Thus, if owners did not bring their cars back to their dealers, these defects would not be repaired and could lead to serious accidents. Shocked by this revelation, Congress wrote the defect notification provisions into the National Traffic and Motor Vehicle Safety Act of 1966. Manufacturers also committed to voluntarily recall defective vehicles for repair at no cost to their owners. Congress also required that all communications from the manufacturers to their dealers had to be sent to the government so that the manufacturers could not so easily conduct secret recall campaigns through their dealer’s vehicle. Some years later, Fiat broke the commitment to repair safety-related defects, and Congress wrote specific recall requirements into the Act. 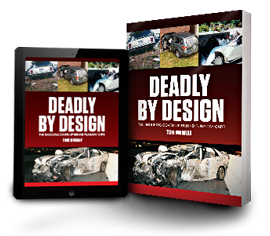 This book was written to expose the fact that some auto companies, including the Ford Motor Company, continue to hide critical safety related defects in its automobiles from their owners and from the National Highway Traffic Safety Administration, the agency responsible for carrying out the safety act. The subject of this book involves defects that can cause motor vehicles to suddenly accelerate, often from a standstill, when the driver is not touching the accelerator pedal. Ford has not only hidden the defect, it has withheld critical information from the government, and from courts hearing product liability lawsuits brought by people severely injured in such cases, or by survivors of those killed.